Corporate event managers understand the complexities of large-scale corporate events. Despite all of the moving parts involved, there is one element that trumps them all: the safety and security of your guests. Professional corporate event security personnel can help ensure that your event runs as you envisioned, without disruptions from any unplanned security threats. The services that our guards provide can help you put on a successful event, allowing you to achieve your organization’s business objectives. Off Duty Officers has been providing security guards to corporate clients for over 25 years. Our guards work hard to make sure that event guests feel safe and event managers have peace of mind. Off Duty Officers’ guards integrate themselves into your overall security program so they can seamlessly address issues with discretion, poise and competence. Your guests should never have to worry about their safety. When you need the best protection available, choose to partner with the leading corporate event security company in the United States. The success of your corporate event depends on the level of security and protection you provide to your guests. Security guards are a vital contributor to your event at all stages of the process. Guards can assist event managers in a number of ways before, during and after an event. Although their responsibilities may vary depending on your needs, our security personnel is ready to assist at all times and act to mitigate a threat when required. Shareholder and board meetings for large companies pose unique security risks. 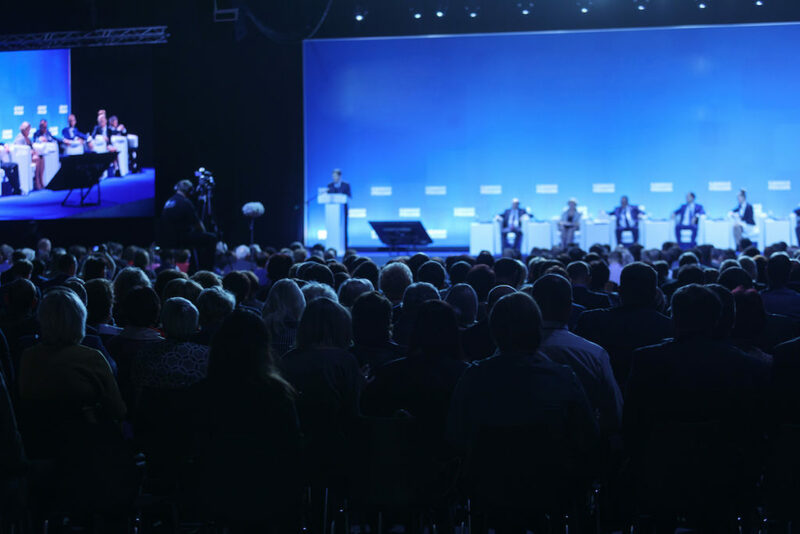 High-level executives and high-profile investors attend these events, increasing the chance of an unwelcome security threat from a disgruntled employee, customer, vendor or other individuals. Often, significant decisions are made at these meetings that could have serious impacts on the lives of stakeholders. When those individuals are impacted negatively, they may decide to take negative action against the company VIPs. Our security guards have specialized training in the handling of these kinds of security concerns. They know how to identify suspicious and high-risk behavior and neutralize that behavior with a number of de-escalation tactics. The goal: to prevent any further disruption of the meeting and maintain the safety of the guests. New product launches and service announcements can be very exciting events for a company. When you want to communicate these developments to your stakeholders, while maintaining privacy until you are ready to launch publicly, you may require the services of a skilled security team. Our security personnel can make sure that the right people are in the room, and the wrong people stay out. They can enforce rules and regulations, including those that prohibit the use of cellphones and other recording devices. We work hard to protect the integrity and reputation of your brand. Trade shows and conventions attract large crowds of people and there are many logistical challenges that can create serious security risks. Off Duty Officers’ guards have extensive experience in securing property and people at trade shows. They are adept at managing the flow of traffic to make sure that people travel through in a safe and orderly fashion, while also preventing individuals from moving into restricted areas. Our goal is to ensure that all of your show exhibitors and guests have a positive overall experience. Off Duty Officers is the leading provider of corporate event security personnel in the nation. We hire off-duty and retired law enforcement and military personnel so we can guarantee that our clients will receive the most competent, professional and respectful service available. And with the caliber of specialized training that we provide to our guards, you can rest easy knowing that your next corporate event will include the best security personnel in the country. If you are planning a corporate event, contact the security experts at Off Duty Officers today to talk with one of our specialists. Our caring and professional team can help you recognize potential event-specific security threats and offer you the best protection strategies to meet your needs.